The Lebanese House is an old deep-rooted architectural style, resulted from cultural interaction and intermingling for long periods. It represents the actual example of house defined by the architect “Le Corbusier” as “A Housing Machine”. It is a flexible mixture of practical reality and heritage revealed in the Ottoman rule until the end of French Mandate. The Lebanese house has developed upon the globalization era tuning its internal and external formations with various civilized styles exported from east and west. When we talk about the Lebanese house, we enter a world of sunshine and light. The relationship of architecture with nature is the central force in the design of any Lebanese house. A moderate climate allowed the Lebanese to enjoy the outside for more than six months a year. Thus was born an architecture that was open to the outside, embracing the landscape, capturing the cool breeze in summer and the warm sun in winter. This openness was achieved through a variety of architectural means. NH HOUSE is a home for a non-Lebanese family who desired living among the Lebanese green hills. 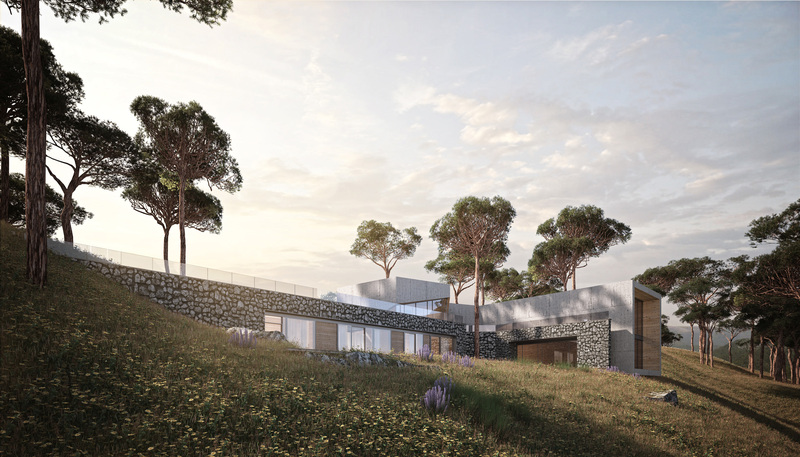 The family chose Ras-el-Matn Hills to build its summer home in Lebanon. Schema has impressed the owner by the house design. 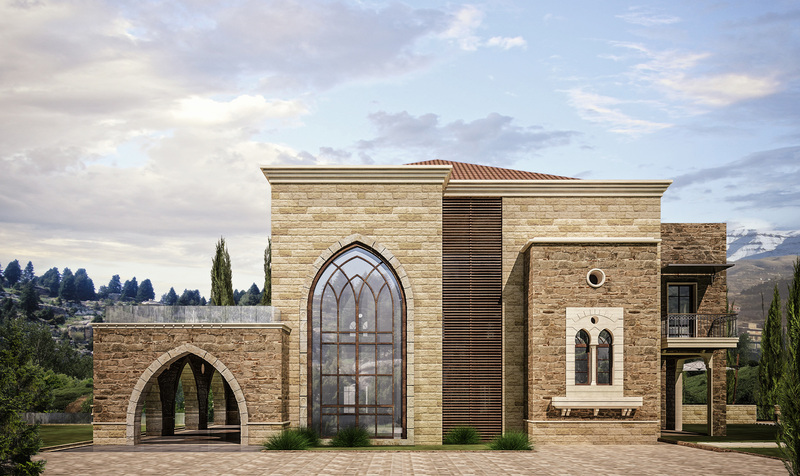 There are three components in Lebanese architecture: the plan, the material and the decorative elements. The plan is very simple. There is a central hall serving all the rooms in the house cancelling the need for corridors: all the activities spring from the central hall. Moreover, the orientation is usually South-West, exposed to prevailing winds, in order to maximize air circulation. The most common material used for the traditional Lebanese house is stone, which used in a very refined way. It is an ancestral know-how. The stone treatment is quite clever and the use is perfect. Red tiles, coming from Marseille, have served to cover roofs since the late 19th century. 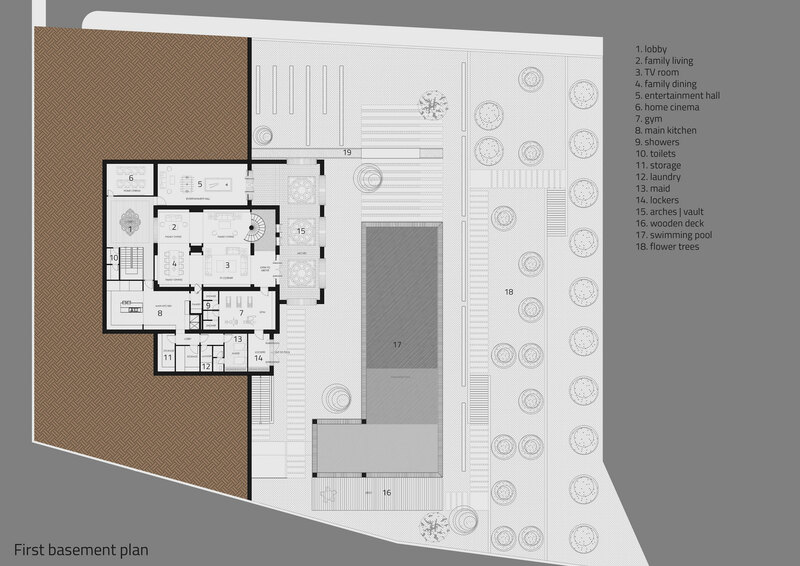 Schema relied on traditional homes designs to plan this home. 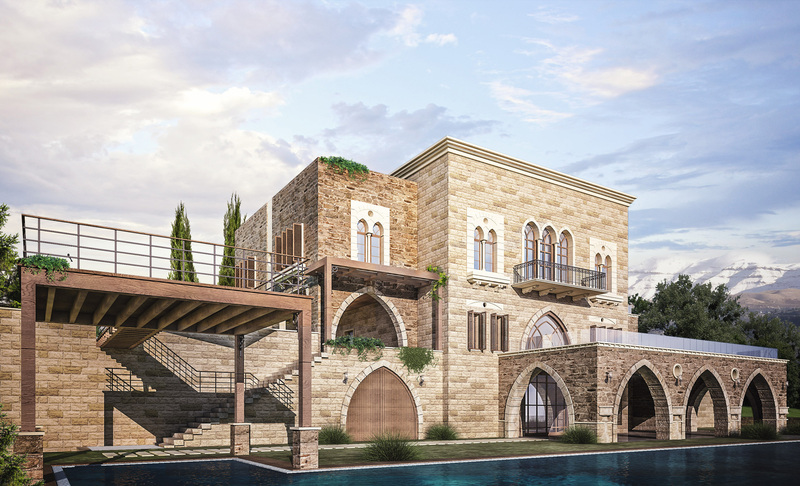 The company focused on blending the home with its urban and natural areas simultaneously in Ras-el Matn-town. This town is known of its homes made of stones and red tiles and based among pine trees. The designed home, as other traditional homes, is build of squared-main block overridden by red bricks. This main block attached to several shorter blocks, forms some terraces for family. These terraces resemble the “mastaba “used as an outdoor living area pergola-overridden suitable for family evening gatherings all summer. 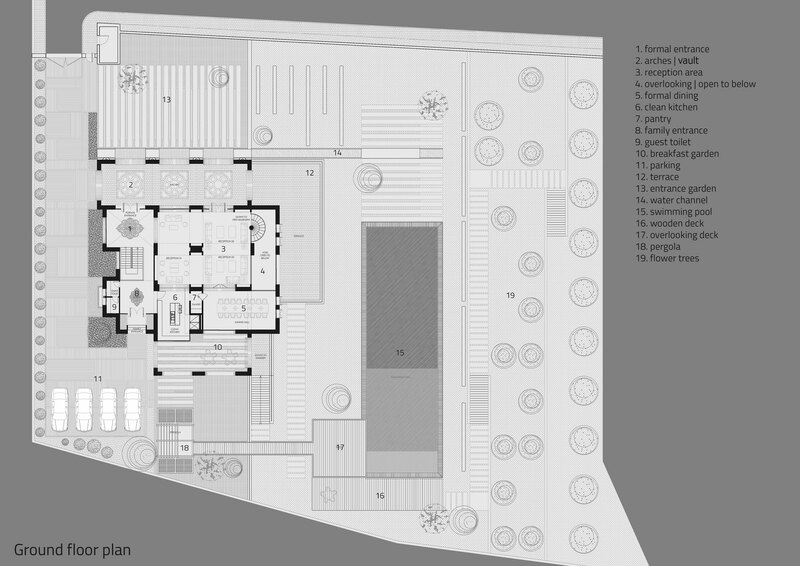 The designed area is about 1000 m2 distributed over 3 floors: a first basement floor, ground floor and first floor. The main entrance in the ground floor is connected directly to the house garden and overridden with a 3-arches. It leads to the reception room, dining room, and a small kitchen connected to the reception room in the first basement floor. It provides visual communication between the two floor and it catches the view of the outdoor garden and water features. 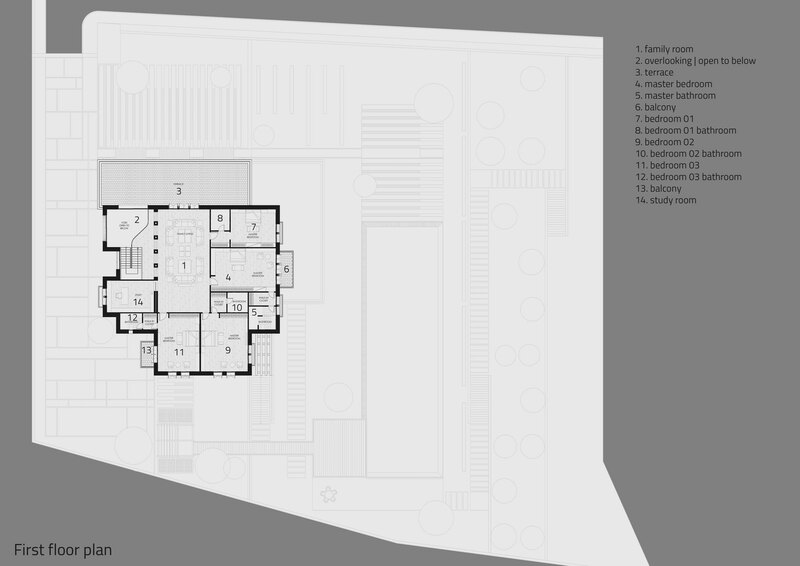 The first floor includes a big living room for the family opened directly to the terrace surrounded by 4 main bed rooms each containing a private bathroom and a dressing room. The first basement floor includes the living room, the main kitchen, food storage rooms, servants’ quarters, a small playing room for children, and a home cinema in addition to other integral parts in the amazing house. 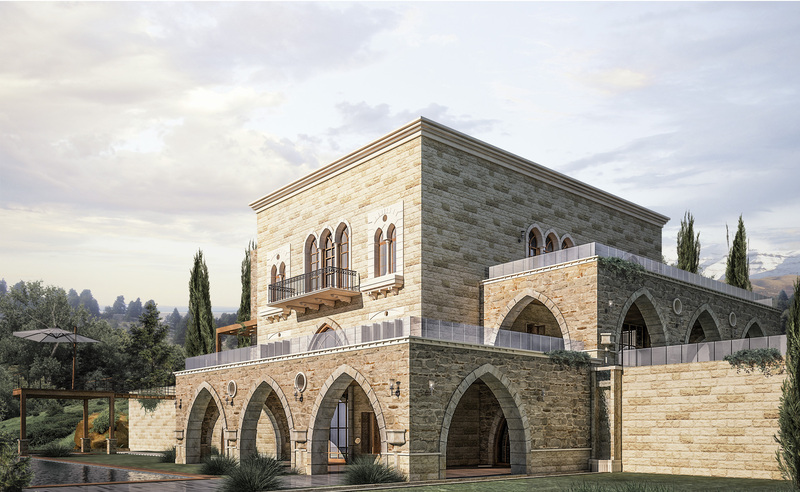 Schema designed the exterior facades of the house reflecting its vivid spirit adding some modern and new-classical touches to the traditional features of the Lebanese house. Two kinds of natural stones cover the exterior facades largely resembling the formations of old facades in color, size and texture. During the design, Schema had mostly focused on ensuring the interaction between the home internal area and the external nature. 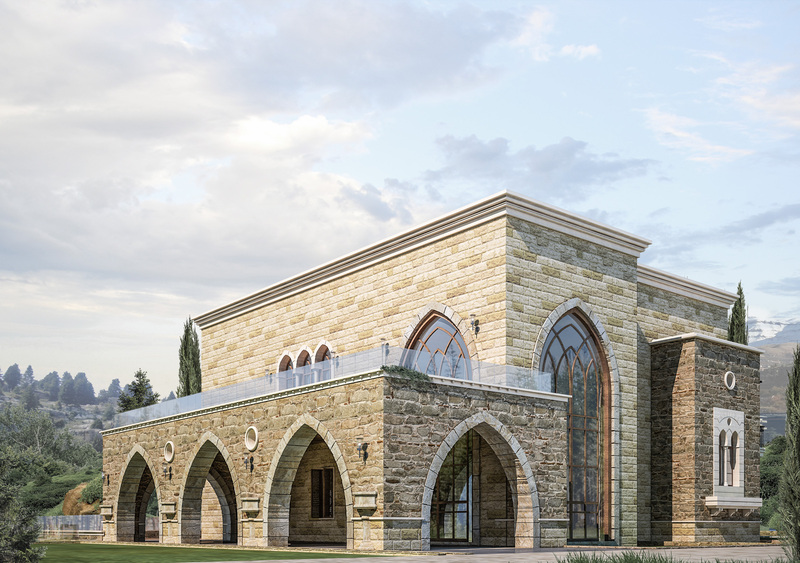 Thus, we have benefited from the technical development that allowed designing the large arches with transparent glass facades instead of small arches. Schema 7 the young and up-to-date company is founded to transform client’s Ambitions into a unique design in a special way inspired from the people’s Culture.Our pledge is to establish long lasting relationships with our customers by exceeding their expectations and gaining their trust through the designed product we present.